Cats, being cats, will hunt things. The outside cats do a great job of keeping the rodent population down. Every now and then, we’ll see signs of their successes. All part of that whole “circle of life” thing. On the way out this afternoon, I took the time to get another pitcher of warm water for the cats before we left. I saw The Outsider by the entryway steps. He looked at me, paused to bat something around, then ignored it for a bit, then batted it around some more. A quick glance and I could see a tiny little fur ball and realized he had caught a vole. Something I’ve seen quite a few times. … and I saw the little legs wiggle. Then I heard the tiniest of squeaks. The vole righted itself, only to have The Outsider bat at it again, and pounce a bit. No claws. No actual biting. Yeah. He was playing with it. The poor thing would get tossed a bit, would right itself and sit there, but as soon as it moved, it would get batted or pounced on again. While squeaking the tiniest of squeaks. Normally, I wouldn’t do anything about this. Rodent population control is one of the reasons farm cats are so good to have around. But I could also see that this little guy was completely uninjured. Plus, The Outsider was interested only in keeping it from running away. He was much more interested in the pitcher I was holding. Then he batted it again, the vole righted itself and just sat there. It made no effort to run away. The Outsider seemed to be wondering what I was doing, until I put the pitcher of water down, when he immediately lost interest in the vole and went for the water, along with three other cats. The vole stayed in my hand, no longer squeaking, but trembling mightily. My daughter came out, and I handed it to her, so I could distract the cats away with the warm water – the bowls of water outside were already frozen. It made no effort to run from her, either. Of course, I got a picture, first. He was so velvety soft! Looking at that long snoot, I find myself thinking it might be a mole, not a vole, but when I try to look it up, I’m not any clearer on this. It’s like it has a vole body with a mole snoot. I’m still thinking it’s a vole. While the cats were distracted, my daughter went to where there were leaves piled up as a mulch in the flower garden on the south side of the house. She made a little nest in the leaves and dropped it in. It snuffled around in a circle for a bit, then she loosely covered it with more leaves, so the cats wouldn’t see it. It’s sooo cute!!!! Lucky you got to hold it!!! I feel lucky to have been able to hold it! 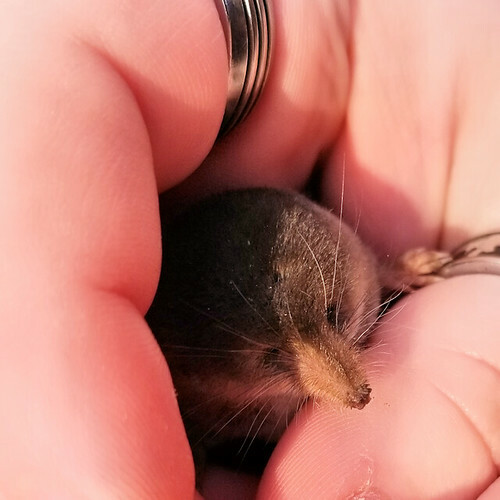 And now I know that it is a pygmy shrew. So cool! I looked in one my grandmother’s books and I’m guessing you “tamed” a Pygmy Shrew. 🙂 apologies to Wm Shakespeare. Oh, my goodness! I just looked them up and you are absolutely right! I didn’t even know we *had* shrews in our area! Thank you so much! You’re awesome! !